"Flavorful mini meat loaves with an Italian flair--moist and full of tomato and cheese goodness from fresh Classico Four Cheese sauce. 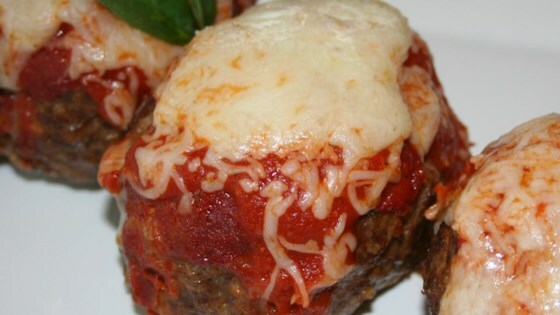 Smothered in mozzarella cheese, these little meat loaves are sure to please!" Heat oven to 350 degrees F. Generously oil the bottom of a 9x13-inch baking dish. Mix together the ground beef and Italian sausage in a large bowl. Add onion, half of the jar of four-cheese red sauce, egg, bread crumbs, Parmesan cheese, garlic powder, salt, pepper, and parsley. Mix until well blended. Divide mixture into 4 oval mini loaves; place in prepared baking dish. Pour the remaining red sauce over tops of meat loaves. Spray the underside of a large piece of foil with nonstick cooking spray; cover dish tightly. Bake for 45 minutes. Uncover and sprinkle loaves with shredded mozzarella cheese. Increase the oven temperature to 400 degrees F. Bake uncovered until cheese is melted and the internal temperature reaches 165 degrees F, about 10 more minutes. These are just very large meatballs, really. In fact, you can use the same recipe and make meatballs. I wouldn't think "meatloaf". But they are delicious and easy so I will make again for sure.